Today's theme focused on the word happy - so I tried to capture a few things that simply made me happy today. 1) A Dream So Big by Steve Peifer. I know I included this book in an earlier theme/photo. I've truly enjoyed reading about Peifer's experience - and continual projects - in Kenya. Some of his stories have made me cry, others made me laugh hard enough I could have snorted coffee. Ultimately, Peifer has given me a new picture of service, of how one person can make a difference in the lives of thousands. Listening to the music of The Museum (yes on my "old-school" iPod), makes me happy right now for a couple of reasons. worship God with their creativity. ...I'm remembering why I love music - and how it can help me "zone" out as I work. 3) Hot tea and Cookies anyone? Tonight (Monday) I went to Canvas Community to experience their unique worship service. One of the blessings - getting to see E dance as the praise band played the last song. Sometimes, watching a wee one be themselves can bring great joy - and E's expression of praise definitely made me happy! 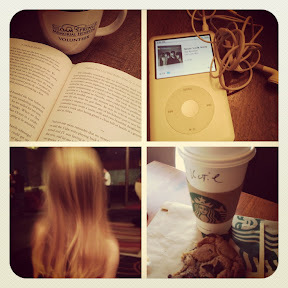 So here are a few things that made me happy on Monday. God is good.... all the time!